Meter Navy Blue A3 Leathergrain Binding Covers 270 gsm (Pkt 100). Use for backs on documents bound with Combs, Wire & other binding systems. Use LGNB2A3 Navy Blue A3 Leathergrain Binding Covers 270 gsm to provide extra protection for your documents and presentations. LGNB2A3 Navy Blue A3 Leathergrain Binding Covers 270 gsm are premium board Binding Covers that give your documents a professional look. Suitable for Comb, Wire, Coil, Strip, Velobind and Tape Binding Systems. 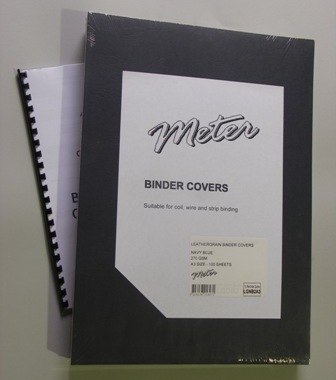 Consider using Meter Navy Blue A3 Leathergrain Binding Covers on the back of your documents together with Meter Clear Binding Covers (available in range of thicknesses) to protect & enhance the front of your bound document. Other sizes can be cut to requirement (phone or email for pricing). Round Cornering also available.